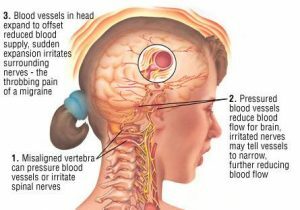 Migraine headaches can be one of the most debilitating conditions anyone has ever suffered from . When migraines are frequent, as they often are, they can bring your everyday life to a screeching halt. At Progressive Chiropractic we have treated many patients suffering from this painful and debilitating condition with great success. The symptoms of a migraine headache vary and can include visual disturbances known as Auras, nausea, stiffness of the neck, light and sound hypersensitivity and throbbing or sharp pain to one or both sides of the head. Many times migraines will lead to increased anxiety, a feeling of weakness, mood changes and fatigue. The cause of migraine headaches can lead a patient down many fruitless paths as many medical doctors will look for treatments before the cause is identified. Many patients have presented to our office with a long history of medication after medication with little, if any, positive or lasting results. The main issue is the failure to address the fact that most conditions people suffer from are “multi-factorial”. This literally means “involving or dependent on a number of factors”. This failure leads many physicians to chase around the “triggers” i.e.. weather, hormonal changes, food allergies and stress while ignoring stress to the nervous system from the cervical spine “subluxation”. There have been numerous studies demonstrating how subluxation of the upper cervical spine can initiate tension, cluster and migraine headaches. When the nerves of the cervical spine are irritated it weakens the body’s ability to handle the added stress of these “triggers”. Other non-spinal factors can be high blood pressure, poor diet, arterial compromise, chemical imbalance and genetic factors. At Progressive Chiropractic we start with a broad view examination including complete health history review, orthopedic testing, palpation, neurological testing, needed cervical x-rays, and systems review. It is vital to assume nothing when treating migraine headaches. After our examination is completed, a diagnosis is determined and personalized treatment is recommended. For those with a subluxation diagnosis a plan for chiropractic adjustments is typically recommended in order to correct the spinal dysfunction and relieve the nerve irritation causing the weakness. Other recommendations are made to minimize the triggers such nutritional modification, ergonomic instruction, stress reduction and obtaining proper sleep and rest. Having suffered myself from migraine headaches I am keenly aware of the misery that can accompany these types of headaches. I personally went through the medical maze of “fixes” and medications with little, if any, help. It was only after my Chiropractor identified the subluxations to my upper cervical spine that I found effective, long-term relief. I am always ecstatic when a patient tells me their headaches are gone! Our Progressive System of Care has been designed for just that outcome, which is why we see significant improvement in well over 90% of our patients suffering from migraine headaches. If you or someone you know is suffering from migraine headaches please call so we can help.